Mdina Glass was founded on in the Maltese town of Mdina, in 1968 by Michael Harris, a risky venture at the time as Mdina had no history of glass making. However the gamble paid off, and Mdina glass was an instant success. The company produced free formed organic glassware, often in colours inspired from the sea, sand, earth and sky, which proved very popular with tourists in Malta. Unfortunately, and quite unfairly, Michael Harris was soon pressured to leave by the Maltese government. 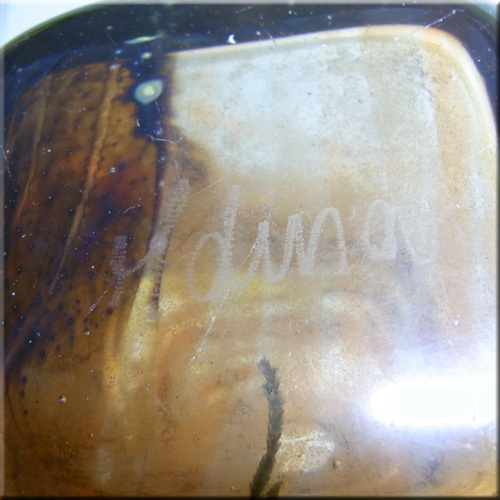 In 1972 Michael left Mdina, and formed a new company, Isle of White Studio Glass, on the Isle of White in the UK. Many of the designs created by Michael Harris continued to be made at Mdina Glass after he left. The company is still active today, and is now run by Joseph Said, who was Michael's most skilled apprentice. Mdina Maltese blue + purple glass vase with yellow speckles and applied trailing, signed to base. Mdina Maltese creamy glass vase with multicoloured speckles, signed to base. Mdina Maltese blue + yellow textured glass vases. Mdina Maltese blue + yellow glass 'pulled ears' vase. Mdina Maltese blue + green glass vase, labelled. Mdina Maltese blue + yellow glass 'pulled ears' vase. Mdina Maltese blue + yellow glass vase, signed to base. Mdina Maltese blue + yellow glass vase. Mdina Maltese blue + yellow bark textured glass vase. Mdina Maltese blue + yellow glass vases. Mdina Maltese blue + yellow glass 'Blue Crystal' pattern vase. Mdina Maltese blue + green glass vase in the striped 'Ming' pattern. Mdina Maltese blue + green glass bowl in the striped 'Ming' pattern. Mdina Maltese blue + green glass vase. Mdina Maltese blue + green glass vase in the fragmented 'Ming' pattern, signed + labelled. Mdina Maltese blue + green glass vase, signed. Mdina Maltese blue + green glass vase in the striped 'Ming' pattern, signed to base. Mdina Maltese blue + yellow glass 'Blue Crystal' pattern vase, labelled. Mdina Maltese blue + yellow glass vase, labelled. Mdina Maltese blue + green glass vase, signed + labelled. Mdina Maltese blue + green glass vase, signed + labelled. Mdina Maltese blue + green glass vase, labelled. Mdina Maltese blue + green glass vase in the striped 'Ming' pattern. Mdina Maltese blue + yellow textured glass vase. Mdina Maltese blue + yellow glass paperweights. Mdina Maltese blue + yellow glass paperweights. Mdina Maltese blue + yellow glass paperweight, signed to base. Mdina Maltese blue + yellow glass paperweights. Mdina Maltese brown, blue + sandy glass 'Tiger' pattern vase. Mdina Maltese brown, blue + sandy glass 'Tiger' pattern paperweight. Mdina Maltese brown, blue + sandy glass 'Tiger' pattern paperweight. Mdina Maltese brown, blue + sandy glass 'Tiger' pattern vases. Mdina Maltese brown, blue + sandy glass 'Tiger' pattern vase, signed and labelled. Mdina Maltese brown + sandy glass 'Earthtones' pattern vase, labelled. 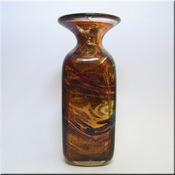 Mdina Maltese brown + sandy glass 'Earthtones' pattern vase, signed to base. Mdina Maltese brown + sandy glass 'Earthtones' pattern paperweights. Mdina Maltese brown + sandy glass 'Earthtones' pattern vase, labelled. Mdina Maltese brown + sandy glass 'Earthtones' pattern vase. Mdina Maltese brown + sandy glass 'Earthtones' pattern vases. Mdina Maltese brown + sandy glass 'Earthtones' pattern vase, signed + labelled. Mdina Maltese brown + sandy glass 'Earthtones' pattern vase, signed. Mdina Maltese brown + sandy glass 'Earthtones' pattern vase. 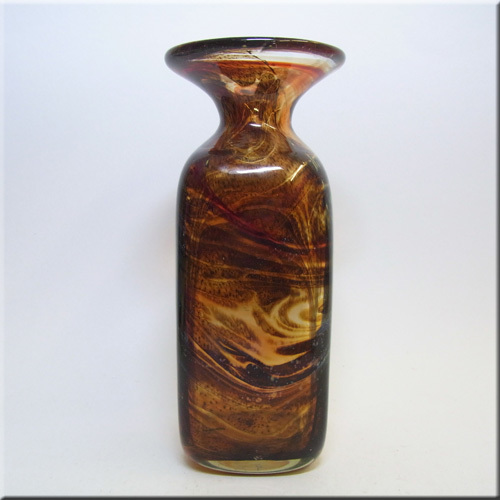 Mdina Maltese brown + sandy glass 'Earth' pattern vase or perfume bottle, signed + labelled. Mdina Maltese blue, white + black glass 'Seascape' pattern vase, labelled. Mdina Maltese blue, white, black + sandy glass 'Seascape' pattern perfume bottle. Mdina Maltese blue, white, black + sandy glass 'Seascape' pattern vase. Mdina Maltese blue, white + black glass 'Seascape' pattern vase. Mdina Maltese blue, white + black glass 'Seascape' pattern vases, labelled. Mdina Maltese blue, white + black glass 'Seascape' pattern vase. Mdina Maltese brown speckled glass 'Tortoiseshell' pattern vase with button rim, signed to base. Mdina Maltese brown speckled glass 'Tortoiseshell' pattern vase, signed to base. Mdina Maltese brown speckled glass 'Tortoiseshell' pattern vase, signed to base. Mdina Maltese brown speckled bark textured glass 'Tortoiseshell' pattern vases. Mdina Maltese brown speckled glass 'Tortoiseshell' pattern vases, labelled. Mdina Maltese brown speckled glass 'Tortoiseshell' pattern vase, signed to base. Mdina Maltese brown speckled glass 'Tortoiseshell' pattern vase. Mdina Maltese brown speckled glass 'Tortoiseshell' pattern decanter. Mdina Maltese brown speckled glass 'Tortoiseshell' pattern vase, signed to base. Mdina Maltese orange glass vases with applied blue glass trails. Mdina Maltese orange glass vases with applied blue glass trails. Mdina Maltese orange glass decanters with applied blue glass trails. Mdina Maltese orange glass vase with applied blue glass trails, signed to base. Mdina Maltese orange glass vases with applied blue glass trails. Mdina Maltese mottled red glass vase with applied blue glass trailing and Maltese cross, labelled. Mdina Maltese mottled orange glass vase with applied blue glass trailing and Maltese cross, labelled. Mdina Maltese mottled orange + yellow glass vases with applied blue glass trailing and Maltese cross. Mdina Maltese mottled white glass vase with applied purple glass trailing and Maltese cross. Mdina Maltese mottled white glass decanter with applied blue glass trailing and Maltese cross. Mdina Maltese mottled white glass bottle vase with applied blue glass trailing. Mdina Maltese mottled white glass vases with applied blue glass trailing and Maltese cross. Mdina Maltese mottled pink glass decanter with applied blue glass trailing and rim. Mdina Maltese mottled pink glass vase with applied blue glass trailing and rim, signed to base. Mdina Maltese mottled pink glass vase with applied blue glass trailing and rim. Mdina Maltese mottled pink glass decanter with applied blue glass trailing and rim. Mdina Maltese mottled pink glass bowls with applied blue glass trailing and rim. Mdina Maltese mottled pink glass vase with applied blue glass trailing and rim. Mdina Maltese mottled pink glass decanter with applied blue glass trailing and rim. Mdina Maltese mottled pink glass vase with applied blue glass trailing and rim, labelled. Mdina Maltese brown glass vase. Mdina Maltese blue, green, brown + clear glass sculpture. Mdina Maltese blue, green + clear glass sculptures. Mdina Maltese blue + clear glass sculpture, signed to base. Mdina Maltese blue + yellow glass 'Crystal Blue Stripe' pattern bowl. Mdina Maltese blue + yellow glass 'Crystal Blue Stripe' pattern vase, labelled. Mdina Maltese blue + yellow glass 'Crystal Blue Stripe' pattern bowl. Mdina Maltese blue + yellow glass 'Crystal Blue Stripe' pattern vases. Mdina Maltese blue + yellow glass 'Crystal Blue Stripe' pattern vase. Mdina Maltese blue + yellow glass 'Crystal Blue Stripe' pattern vase, signed + labelled. Mdina Maltese blue + yellow glass 'Crystal Blue Stripe' pattern vases, signed. Mdina Maltese frosted brown, blue + sandy glass 'Tiger' pattern 'Lollipop' vases, signed to base. Mdina Maltese brown, blue + sandy glass 'Tiger' pattern 'Lollipop' vase. Mdina Maltese mottled white, yellow, orange and blue glass 'Lollipop' vase. Mdina Maltese mottled white, amber, pink and black glass 'Lollipop' vase. Mdina Maltese pink + grey glass vase, signed and labelled. Mdina Maltese pink + grey glass vase, signed and labelled. Mdina Maltese green + grey glass vase. Mdina Maltese mottled pink glass decanter. Mdina Maltese mottled pink + blue glass 'side stripe' vase. Mdina Maltese mottled white + brown glass vase. Mdina Maltese mottled white + orange glass vase. Mdina Maltese yellow, blue + brown glass vases in the 'Sea and Sand' pattern. Mdina Maltese yellow, blue + brown glass vase in the 'Sea and Sand' pattern, signed to base. Mdina Maltese yellow, blue + brown glass vases in the 'Sea and Sand' pattern. Mdina Maltese yellow, blue + brown glass decanter in the 'Sea and Sand' pattern. Mdina Maltese yellow, blue + brown glass vase in the 'Sea and Sand' pattern. Mdina Maltese mottled pink glass vase, signed. Mdina Maltese white glass vase, with applied pink rim, and pink + black speckles. Mdina Maltese orange + blue striped glass vase. Mdina Maltese orange + sandy glass vase. Mdina Maltese green + pink glass decanter. Mdina Maltese blue + yellow glass vase, labelled. Mdina Maltese blue + yellow glass 'Blue Crystal' pattern vase. Mdina Maltese blue + yellow glass vase. Mdina Maltese blue + yellow textured glass decanter. Mdina Maltese blue + yellow glass obelisk paperweight. Mdina Maltese brown + sandy glass 'Earthtones' pattern vase. Mdina Maltese blue + yellow glass 'Blue Crystal' pattern bowl. Mdina Maltese green + grey glass vase. Mdina Maltese pink + white swirl glass vase, signed and labelled. Mdina Maltese blue + yellow textured glass decanter. Mdina Maltese green + red organic glass vase with gold leaf, signed and labelled. Mdina Maltese orange + blue striped glass vase, signed + labeled.